She wrote letters about her concerns, letters about how her rights were being taken away. But the letters didn’t get anywhere. Even her right to communicate with the outside world and express her concerns to an advocate she knew well had been taken away. Case Advocate Molly Klocksin knew something was wrong. 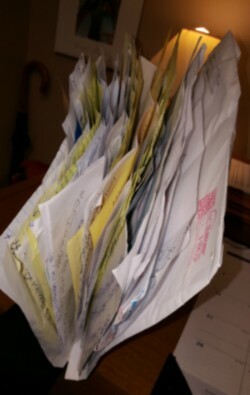 She’d read and responded to many of Elaina’s letters over the course of almost two decades. She understood the woman and her concerns and provided advice and assistance to her when possible. Sometimes the assistance consisted of simply listening and responding. But one day, the letters and the phone calls just stopped coming, so Molly followed up, and what she found was appalling. Someone had informed the staff to keep the letters that Elaina wrote. Don’t send them, they said. We don’t want her to bother anyone, they said. How would you feel? If you were stuck somewhere you didn’t want to be, and one of your few links to the outside world was taken from you, without your consent or input? How would you feel if your rights to call or write to whomever you wanted were restricted that way? Don’t you hope there would be someone like Molly who would realize that something was wrong and check to make sure that you were okay, and that your rights were protected and enforced? You can help us make sure people with disabilities’ rights are protected. You can help make sure that people with disabilities can report abuse or neglect and find the assistance they need. Your donations help us inform people of their rights and get the word out about how we can protect and advocate for them. Showing your support with a donation is as simple as a couple clicks. Click here to donate. You’ll be glad you did, and thank you for being an advocate.